If you buy this book—as I’m begging you to!—you will get to know him. 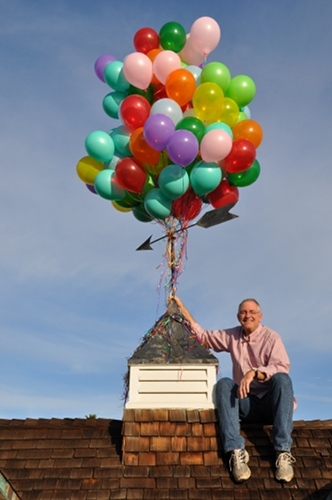 Bob Goff is, I’m quite sure, as he appears; the real deal, as they say. He is transparent, honest, energetic, optimistic, full of the love of God, illustrated by his being an active (and do I mean active) follower of King Jesus. As he puts it, he likes to “leak Jesus” on others, and once he compliments you, affirming you for doing that (whether it is true or not) you want to rise to the occasion. You want to be awesome. You want to allow God to spill out into everything. You want to live large, make a difference, take risks, have fun, and get busy leaving faint fingerprints of the holy on the things you touch. You, too, want to leak Jesus. I first met Goff at a Christian Legal Society annual affair a couple of years ago, a big event where he was, or so I thought, going to give a standard talk about an orphanage he started in Uganda. I thank God for these great missions of mercy, and we have supported such anti-hunger programs for all of our adult lives (and before. My mom had us “trick or treat for UNICEF” in the mid-60s. So yeah.) I must admit, though, I wasn’t on the edge of my seat at the banquet, waiting to hear another sob story about poor kids and another nice testimony of somebody doing routine mission work far, far away. â€¨â€¨And then he started excitingly telling about the lady that ran a red-light hitting and blowing up his jeep, watching it burst into flames (how cool is that? he exclaimed) and how he cared for her afterwards. His academic past was less than stellar and his legal calling was sketchy, since he hardly passed his entrance exams. The story about how he badgered the Dean of the law school to let him in anyway (told hilariously in the chapter “Get Your Books”) had me in stitches, and eager to be more audacious in my endeavors. Hearing him explain how he has his law office on some faux island at Disneyland that you have to get to by a little boat—he is not making this up: he showed slides of his meeting with an important African diplomat on Tom Sawyer Island—had us texting friends asking if they had heard of this guy. Could he be for real? That zany, and that successful, and that adept at advancing God’s reign and glory through his uniquely Christian way of thinking about vocation and calling, profession and professionalism? Can an old Young Life nut who just loves everybody really pull off these whimsical spiritual stunts (which he calls capers) and make a serious difference in a broken world of serious evil and injustice? If he’s just a postmodern clown, okay, that’s attractive and entertaining, but he seems also to be truly interested in changing the world, reforming legal institutions, working in the third world, literally saving lives. Can funny stories change things? Look. Jesus rose from the dead, right? Knocked that stone right away from that grave, right? In a strange world like that, where a servant King whose regal crown was one of thorns, where a Messiah takes the city through riding not a warhorse, but on a donkey , well, in that kind of an upside down world, maybe a Bob Goffian sense of goofiness really is the new normal. Maybe we don’t change the world through power, but through kindness and mercy, joy and goodness. Maybe Dostoyevsky was a bit wrong: beauty won’t save the world, whimsy will. Bob Goff does more than tell incredibly interesting, exceptionally entertaining and truly inspiring stories—like how he loaned his house to a kid he didn’t know who wanted to propose to his girl in a smashing way, or the one about pranking a best friend by checking into his honeymoon suite, or a great telling of a particularly fruitful game of Bigger and Better, or a funny remembrance of a childhood episode of being shot by his pal with a bb gun—he tells stories about profound structural reform in some of the most unjust places on the planet. Which is to say, in Love Does, you will cry a bit. Mostly tears of laughter, tears of hilarity. Maybe you’ll even wet your pants. But there will also be quiet tears of gratitude that God in his mercy has raised up a man like this, to do good work like this. Like what? Like getting child soldiers out of jail to get fair trails, like meeting world leaders to create space for international conversations of reconciliation, like getting laws passed to prevent ritual maiming of children, like fighting in the front lines in the battle against sexual trafficking. Through his upbeat and graciously relational style—he’s obviously an off-the- charts extrovert, whatever Myers-Briggs letters indicate such buoyant, funny, courageous types—he has been able to finagle laws being passed in certain African countries. As he told us at Jubilee in Pittsburgh 2011 (see my report, here) he has liberated children from hellish prisons. He has helped consult with those making legislative initiatives in Uganda where he is now a diplomat. And, by the way, he’s quick to report (in the chapter “Just Say Yes”) that this official designation gives him diplomatic immunity. He can speed without fear of tickets. In fact, he notes, he could probably kill you and get away with it. Just sayin. So, Goff mixes whimsy and courage, silliness with the sacred, daring and joyful capers with daring and important political reform. And, although it is not terribly gratuitous, he even tells a fart story. n this wild ride of a read. Skip the basic Christian growth books that say life can be an adventure when serving Christ, that we can have passion and purpose. Most of them have no idea. Few of us do, really: this is a vibrant, effective, grace-filled, and Christ-like kind of adventure I swear I’ve never witnessed before. I have not been so viscerally enthused and motivated and excited by an author since perhaps the first time I ever heard Tony Campolo at his best. “It’s Friiiiiidaaaaay, but Sunday’s comin'” Tony used to preach. “The Kingdoms of this world have become the Kingdom of our Lord” he would shout. The crowds would be on their feet, shouting along, “and He shall reign for ever and ever and ever.” Hallelujah!! Oh yeah, with Campolo, we were fired up and ready to make a difference — and many truly did, signing up for urban living with Mission Year or adopting a Compassion International child, taking mission trips to Haiti or working for peace, rejecting materialism, thinking afresh about our callings and careers, wondering how to be most faithful in our work and public lives as well as in our “quietude” as he used to say. Many BookNotes readers can recall that first time you heard Campolo and his funny, rousing sermons. Oh, did he make us laugh. And he spoke hard truth. Tony is a world-changing, cultural-shaping, poverty-fighting, white professor who preaches like a historic black preacher, and some of his talks became legendary. 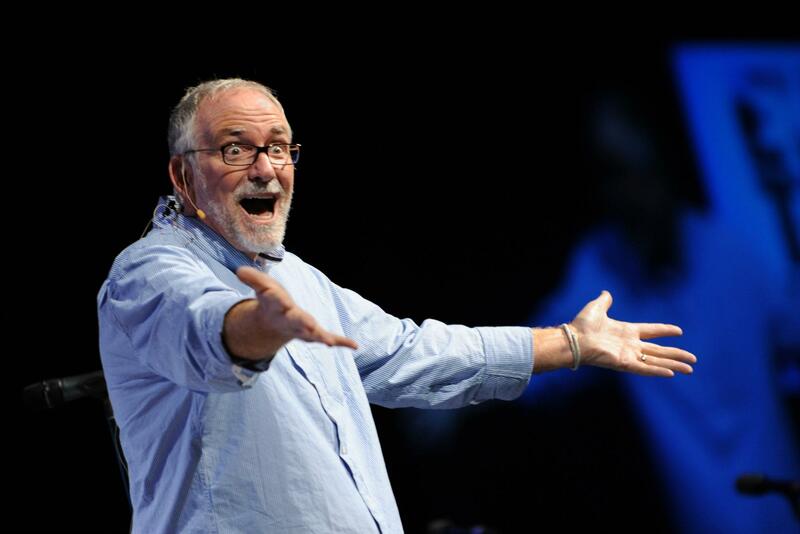 Bob Goff is equally energetic, and his stories are as funny as any Tony ever told. Perhaps some are more goofy; some are just sheer nuttiness (jumping into the bay dressed in a tux in order to greet some kayakers) and you can’t help but enjoy reading about them. Love Does is a fun read, you could give it to teens, easily. But, as with Tony and some of his fantastic stories, you can just know that a sovereign God is behind them (or at least some of them.) I’m talking miracles of the first order, crazy stuff you just can hardly believe. Coincidences, as they say. God is alive and well and his winsome followers like Goff are leaking his love all over the place, and the Spirit is blessing it in mighty ways. When love does, good things happen. I said a while ago to a small group of clergy that this book will no doubt be declared as one of the best Christian books of the year. If for no other reason, the stories are a hoot and the shenanigans he gets himself into so interesting, that it will be used by storytellers and preachers for sermon illustrations, to help us make our points. These stories are made for re-telling, and we commend them to anyone who wants to be a more interesting communicator. Buy the book for the great stories. 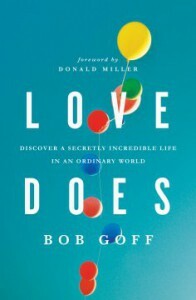 But, as I have suggested, Love Does: Discover a Secretly Incredible Life in an Ordinary World by Bob Goff is more than just a collection of funny stories and audacious examples of stepping out in faith. There are lessons to be learned, ideas with which to struggle, principles of the Christ-life that need to be explicated, grappled with, embraced and embodied. There is good stuff to learn here about discipleship. Stuff we have to practice, habits of the heart to nurture (generosity, hospitality, trust, humor, kindness, freedom) and stuff we get to do. You should buy the book for the whole package, the adventures and the principles, the stories and the lessons, but the bottom line comes through over and over and over. The title says it all: true love causes us to get involved, to actually express our caring, to show our love, to do things for others. You know the famous verse from the epistle of James: faith without works is dead. Sweet Mr. Goff and his beloved Sweet Maria, don’t have to cite the verse, really. Their lives, in little and big ways, in how they love their neighbors, how they help their friends, how they work for justice, how they get involved in global ministries, are a witness to the truth. No, faith that doesn’t do much isn’t real faith. And love that doesn’t reach out, well, it isn’t real love, I guess. You learn this from the Goffs’ lives and from his compelling call to us all: just do it. Love isn’t sentimental. It sometimes picks fights. (Yep, he has some good stories about that) and it almost always involves taking risks. The risks Goff takes are recorded here for us to be encouraged by. En-couraged. I don’t know if it is true to say this, but, in Goff fashion, I’ll just say it anyway and hope I’m not too off-base: to be en-couraged means to be given courage. This book will put some wind in your sails, some guts in your gusto, it will make you want to be a more courageous person. I’m not kidding. It is one of the best books of the year, by a man who has shown encouragement to many, whose parables of whimsy just might change your life. And the world. We would be pleased if you ordered some from us, at the link below. 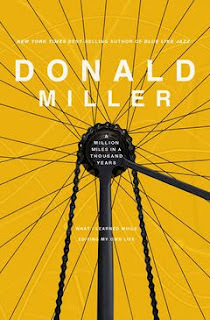 A big PS: I should have said this earlier, but if you don’t know, Goff plays a significant role in another great book, A Million Miles in a Thousand Years: How I Learned to Live a Better Story by Donald Miller (Nelson; $15.99.) In that book (I hope you know, since we love it so) indie film-maker Steve Taylor shows up to make a movie inspired by Miller’s meandering thoughts about religion-less faith, Blue Like Jazz (Nelson; $15.99.) Alas, to make a movie about a memoir supposes that the memoirist has some sort of life story, something good going on, a trajectory, a tale to tell. Miller realized (by studying how to make a film script, as he explains in Million Miles) that he needed to get his life aligned with the larger story of God, a purpose-driven life with something big and meaty unfolding in some Biblically-shaped, coherent plot. He needed to find himself a mentor, the kind of life-changing, one-of-a-kind, Jesus-leaking character that a character like Miller could take. Goff is his man. If you’ve read Million Miles in a Thousand Years then you know that Miller talks about Goff—-his annual New Year’s Day parade that one cannot watch, but must be in, his orphanage in Uganda, where he gets Miller to pick up a shovel and plant a commemorative tree. Goff not only tells a better story than Donald Miller’s bohemian ruminations, but he invites him into that story. Through Miller’s memoir, we learn that a good mentor does that. In more traditional terms, although neither Miller nor Goff use these exact words, a faith leader does evangelism and disciple-making, helps get folks converted to Jesus and equips them to live into the new way of His kingdom. Supreme Court, as they try on Mickey Mouse ears on Tom Sawyer Island? Who calls his engagement with Scripture not “Bible studies” but “Bible doings”? â€¨â€¨Yes, that man does exist.